Bishop James Madison succumbed to what he and his contemporaries called “dropsy” in March of 1812 (dropsy is the old fashion name for edema; a build up of fluid in the body’s cavities or tissues). By that time the Protestant Episcopal Church was in a troubling condition. It was difficult to have enough representatives to hold a convention and conduct diocesan meetings. His successor, Rev. Richard Channing Moore, took over as Bishop in 1814. It would be under Moore that the church experienced something of a revival. To be sure, not every parish experienced better times. At Bruton Parish, the old church was severely altered and the old organ was sold to help with renovations. The modernization of the Church left it in a condition hardly recognizable to the 18th century luminaries who worshiped at this Capital prior to 1780. But, many congregations saw a time of revitalization. St. John’s in Hampton, previously known as Elizabeth Parish, saw a time of restoration to their building, election of a new vestry and calling of a Rector by 1830.1 At the “Old Brick Church”, the presence of the Protestant Episcopal Church began to emerge in 1821 under the direction of a Deacon named W. G.H. Jones. Jones began to utilize the old Anglican church site for a mission effort within the Episcopal Church. That mission grew throughout the 1820’s. In 1828 we see the first use of the name St. Luke’s for this fledgling Episcopal Congregation. Once again the “Old Brick Church” was being used for its original purpose. But, that wouldn’t last long. In 1832 Mallory Moore Todd donated a building in the town of Smithfield and four years later the people of “St. Luke’s” moved in and reconstituted themselves as Christ Episcopal Church. The result was devastating for the old historic building, as it became gutted by the time of Bishop Meade’s report to the Virginia Diocese in 1857 telling of the deterioration of the inside of the building. It would take another forty years for the building to see a time of rejuvenation under the direction of Christ Church and their Rector, Rev. David Barr. Throughout the Diocese congregations were having a new birth. 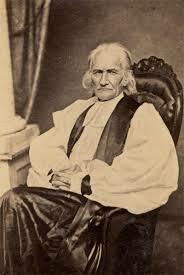 When Bishop Moore began in 1814 there were seven participants in his election. 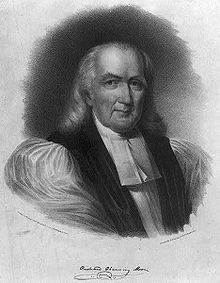 By the time of his death, in 1841 there were 95 clergy in the Diocese, almost to the same levels prior to the Revolutionary War. 2. To be sure, these congregations wanted to be seen in a different light than their pre-Revolutionary ancestors. Congregations changed their names from their old parish titles to new names like St. John’s, St. Peter’s, and Christ Church. The new Protestant Episcopal Church took great pains to limit the power of Bishops, to place control firmly in the vestries and to operate in a much more “American” low church manner. However, the fact that any semblance of a denomination with its roots in the Anglican Church survived is nothing short of miraculous. The memory of the old “Established Church” made their efforts more difficult. But, the firm leadership of Bishops Moore, Meade and Johns empowered the church to overcome overwhelming odds. As modern Episcopalians struggle during a time of lowered religious commitments, there may be some hope in remembering a history that saw even more difficult times and a caliber of leadership that was equal to the struggle.